This train was originally pulled by a smaller 2-6-0 "Mogul" type steam loco for the last three years , and after that the duty has passed to more powerful a 4-8-2 "Mountain" class you see below. In my fictional universe, the train starts at Chicago (Illinois), with stops at Springfield (Illinois), St. Louis (Missouri), Memphis (Tennessee) before terminating at New Orleans (Louisiana). The Emerald Express started in 1917 with a 2-6-0 Mogul, which was quickly overworked with the heavy four-car train. To solve this problem, a 4-8-2 Mountain type was built in 1935 to take over the train as a third coach was being added and the little steamer couldn't handle the job anymore. This 4-8-2 (4 leading, 8 drivers, and 2 trailing wheels) Mountain – type locomotive numbered 6437 was built in the mid 1930's by Baldwin Locomotive Works. The type 6437 belongs to was designed for both freight duty and passenger traffic and as such were not streamlined. This type are basically enlarged versions of the Mountain types of 1926, and are same mechanically though the heavier weight cuts the top speed down to about 95 MPH. The Emerald Express, pulled by a overworked 2-6-0 since 1917, was upgraded with 4-8-2 number 6437 in 1936 when another coach was added to the train, and was painted a dark green to match the heavy-weight rolling stock. The detailed cab features many gauges and the firebox door. The name of the railroad (Brick Railway Systems) goes on the tender walls, while 6437 goes on the cab sides. Combination baggage and passenger car, which I call an "express baggage", though it is actually called a combine in real railroad slang. Three identical coaches. Can you guess which one is the newer one? The observation car of the Emerald Express. 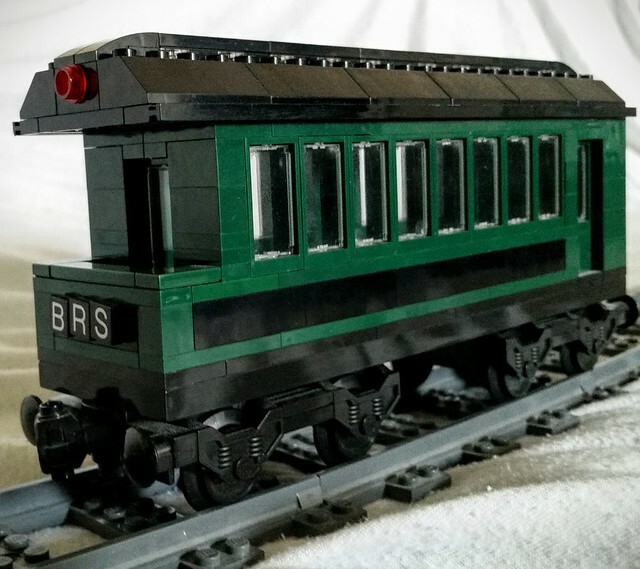 The letters BRS stand for Brick Railway Systems, the owner of the train. Added newer engine pics and ldd file for engine and tender as seen here. 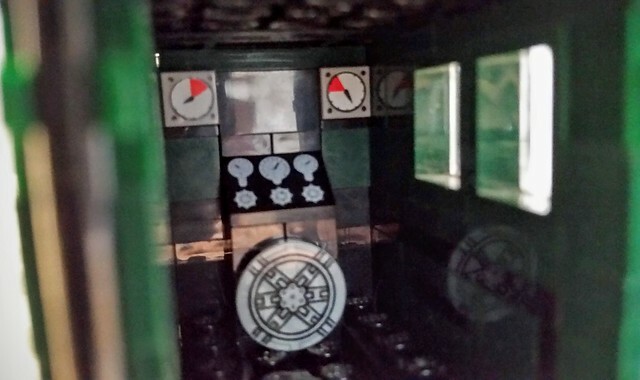 Put in pictures of version three of the engine, with the placement of the domes on the boiler revised and the headlight moved to atop the boiler. Comments, questions, and complaints are always welcome, so please give feedback! 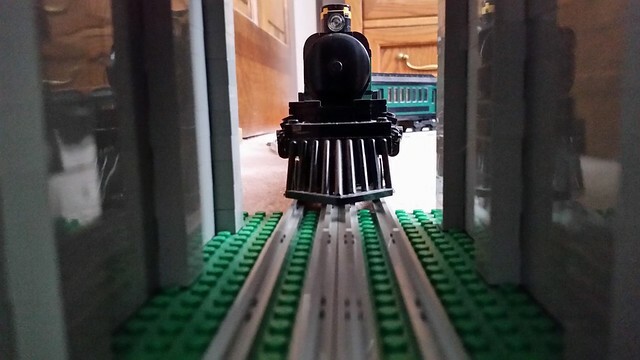 Just something I made with some of my trains and my dads 12v / 4.5v track and custom tunnel. 10 minutes of planning and re-shooting videos, leads to 5 seconds of hand powered trains seemingly moving under their own power... while I used my foot to move the train, I used my hands to make the camera stay still. still photo of the video. sorry for the bump, but the ldd files and pictures have been updated due to revisions of the Mountain-type steam loco. MODS: Sorry for the bump! 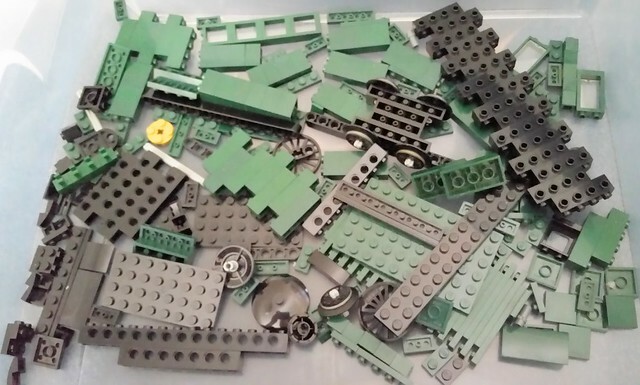 I finally started finding parts for the Emerald Express' extra passenger car and 4-8-2 steam loco. The rest of the parts not seen here have been ordered from Brick-Link. However, my 2-6-0 steam loco will be scrapped in order for it's parts to be reused... dark green is a expensive color, and 1 x 2 x 3 windows are in this color are 1.50 (USD) or more apiece! Train finished, topic edited and title changed. Sorry about the bump! Engine 6437 is sitting in the freshly fallen snow on the ready track at O'Leary Yard in Chicago. She is quite visible though the slight fog in her dark green paint scheme. The engineer reads his orders once more and pulls the whistle cord. She is moving very slowly, as if waking from a deep sleep as the headlight comes on. The loco is heading off to the Dearborn station and the Emerald Express passenger train waiting therein. Soon she and her train will be heading to the warmer weather of New Orleans and the gulf coast of Louisiana. Added pictures of version three of the loco. Any thoughts? Nice; seems like it should work on LEGO track if you're alternating blind drivers in there... the passenger cars look like MOT, but modified. 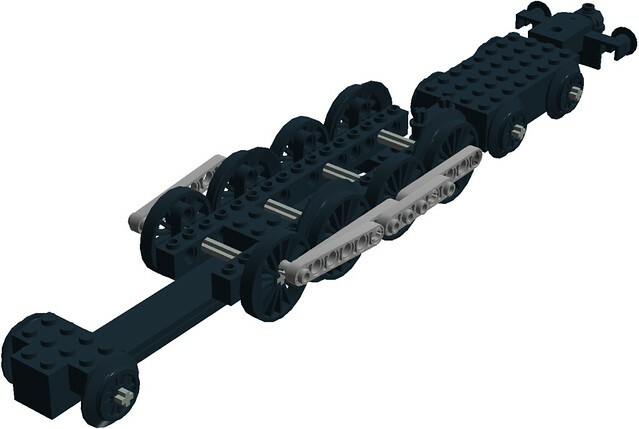 So I see pictures on LEGO straight track, but will it actually run on curves? 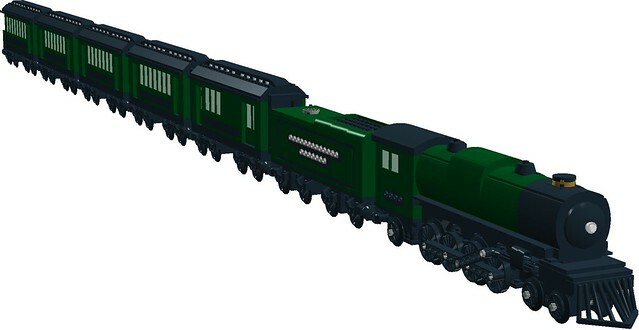 Note that TLG released a set called "Emerald Express." Pales in comparison to yours (it's just a mini). Yes, I alternated blind drivers with flanged ones. However, as this picture shows, I forgot to test the loco with the tender attached, and now have to shorten the roof of the cab by one stud. (it bumps into the tender on the curves, especially switches!) And yes, the cars are MOT inspired (set 10015). What works for you better: having the first pair of drivers blind or flanged? 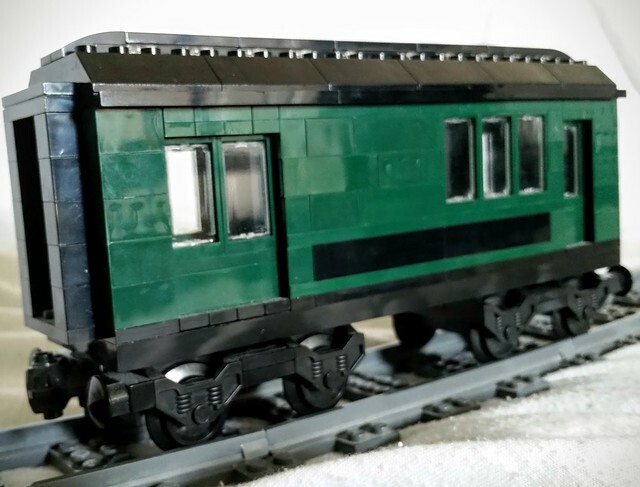 If you have a singe Emerald Night-style single axle pony truck at the front, and a four wheel EN-style bogie in the back (like my train), then it's BFBF. I learned the blind wheels work best next to a pony truck, while the bogie works better next to a flanged wheel. However, their are ways to do this differently, such as a a pony truck next to a flanged wheel, but then you have to do what Anthony Sava did on his Berkshire and draw-bar the pony truck underneath from the second driver (a flanged wheel, as seen above) From my experience, blind wheels do NOT work next to pony trucks if hooked directly to the blind wheel EN-style. Every style I've just said has it's drawbacks, such as fragility (I'm looking at you draw-bar!). Just don't ask about the 2-10-4 Texas I made a while back.... I couldn't get that to work for the life of me, and i don't know why! MODS, sorry for the continual old post bumping, i'm just cleaning up my backlog.